​This programme focuses on ​building capacity of the women most affected by climate change and ​collecting evidence on the impacts faced by communities. Our advocacy aims to ensure climate framework and commitments ​from local to global level to respond to the realities of Asia Pacific women, and institute more gender-just and ecologically principled solutions. The programme conducts Feminist Participatory Action Research (FPAR) with grassroots women’s organisations and their communities, and mobilise cross-movements collaboration to co-create a Feminist Fossil Fuel Free Future. 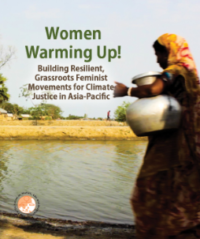 We work to ensure that the voices and demands of Asia Pacific women for climate justice are integrated in policies at local, national, regional and international levels, towards advancing sustainability and women’s human rights. This work is even more urgent than before as the severe impacts climate change of are intensifying and countries in Asia Pacific are among the most vulnerable. Women bear the brunt of climate change impacts, are more likely to become casualties of extreme climate events, and their lives are more affected by drought, floods, crop loss and access to water. We have been gathering data of these impacts and adaptation strategies through our Climate Justice Feminist Participatory Action Research, amplifying the voices of women in communities so that their insights and experience informs policy at all levels. We support them and our members to engage at the UN Framework Convention on Climate Change (UNFCCC).